What informed the Port Harcourt bid in the first place and what were your wildest expectations for the bid? We entered the race to win. As Ropo Ewenla, the PEN Nigeria Secretary General, said at the press conference to announce our bid, Port Harcourt represents the future of books and giving the World Book Capital title to us would go a long way to promote books and reading, not just in Nigeria but on the continent of Africa because of Nigeria’s strength and influence on the continent. Looking at the criteria used to determine the World Book Cities, we believed that our proposal with its rich quality of programmes stood a good chance. We were also encouraged by the book-friendly Rivers State leadership. Part of the criteria for entries is the backing of the bidding city’s authority and Governor Amaechi wrote a letter that strongly supported our bid. Then, of course, there is the fact that in the 11 years of this initiative, no city in sub Saharan Africa has been nominated; only Egypt has held the title. We felt our time has come. As you know, 2014 is the year of Nigeria’s centenary and we thought it presents a great opportunity to boost our reading culture which is one of the benefits of the World Book Capital year. With PH winning the bid, what can you say are the immediate and long-term benefits of the award of literary city status to the ‘garden city’ and Nigeria as a country? The UNESCO World Book Capital title is a recognition of the various efforts, over the years, to promote books and reading in the city of Port Harcourt. It is an acknowledgement of the contribution of writers like Elechi Amadi, Gabriel Okara, Ola Rotimi, Ken Saro Wiwa, Minjiba Ateli and more recently, Kaine Agary, Chimeka Garricks and Igoni Barrett. It is also an acknowledge of the part played by organisations such as the Association of Nigerian Authors and the Rainbow Book Club in making this city the literary hub that it represents. Indeed it highlights Port Harcourt’s rich cultural heritage of which I am a beneficiary. I recall that as a child, in the 70s, my father would take us to the theatre in the old Port Harcourt town to watch performances by the likes of Doye Agama and Barbara Soki. This title would boost business in the book chain industry. We expect heightened interest in, and greater support for, book related activities. We expect to see more libraries, bookshops, and publishing houses emerge not just in the city but throughout Nigeria. This should result in an improved reading culture. An improved reading culture will have a ripple effect on other areas of development because it makes dissemination of information easier, thus adding to our intellectual bank and our knowledge economy. We should therefore see a reduction in the challenges we face in other areas such as education, healthcare, safety, security, etc. The World Book Capital should also translate into what I call intellectual tourism. Already we have people coming from around the country, other parts of the continent, and even other continents, for the annual Garden City Literary Festival. Now, we would expect an increase in these numbers. Increased visitors to the city and indeed the country should mean more business opportunities for us. As I have mentioned already, the year when we hold the title happens to be the year of Nigeria’s centenary celebration and the world would have its eyes on us. This represents a significant opportunity for Nigeria to embark on a genuine re-branding campaign. Most of the news coming out of Africa is negative: war, famine, coups, poverty, etc. The Port Harcourt World Book Capital represents a positive aspect of our lives as Nigerians and Africans – that is good news for a change. During this period Nigeria can showcase its contribution to the literary world. And why not, after all we have given the world the first person of African descent to win the Nobel Prize for literature, Wole Soyinka; the author of Africa’s most popular novel, Things Fall Apart, Chinua Achebe; and world class poets and playwrights like J P Clark. We also have other literary greats such as Buchi Emecheta, Chukwuemeka Ike, Niyi Osundare, Femi Osofisan, Odia Ofeimun, and in the younger generation the likes of Adaobi Nwaubani, Chimamanda Adichie, Uwem Akpan and Chibundu Onuzo. The benefits of holding the title of World Book Capital do not accrue to Port Harcourt only, but to the Niger Delta, Nigeria and the African continent. How does it feel winning the ‘contest’ ahead of other well known first-world cities that competed alongside PH? It is humbling and encouraging. We entered the race late in the day. Many of the contenders had already registered a strong presence on-line with a lot of support and publicity. Cities like Lyon (France) were there; when I saw that the city of Oxford (England) was also in the race, I felt that if we contested it would be a case of David before Goliath. But then I remembered the outcome of that biblical story, so rather than back down, I took a leap of faith. The rest, as they say, is history. How has the news of the win been received/celebrated in Nigeria? Has it been encouraging? One of the first people I informed was Prof. Wole Soyinka; he was excited. He said to me it is ‘a well deserved vindication of your vision’. Chief Emeka Anyaoku was also amongst the first people I contacted and he sent us his hearty congratulations. Renowned writers Ama Atta Aidoo, Niyi Osundare, Femi Osofisan and Sefi Atta have all been in touch to rejoice over the news. We have continued to receive encouraging messages from people from far and wide, as well as international media houses requesting interviews. The support has been quite encouraging indeed. What roles do you expect Nigerians to play (individually and collectively) as we move nearer to 2014 to make the 2014-2015 literary year a huge success for the country? We expect every Nigerian to see this as his or her victory. We would need all hands on deck. We will need to work with relevant government ministries at the federal and state level. We would need the media houses to help us create awareness for our programmes; the Arts communities to help with executing programmes; icons in different fields (music, Nollywood, sports) would be needed as mentors; the corporate organisations can see this as a Corporate Social Responsibility opportunity and provide financial help. The grassroots organisations can help with mass outreach, civil society and NGOs can partner with us. Professional organisations can lend us their expertise. We would also be working with schools. We would need many, many volunteers. It will take a collective effort to deliver the programmes proposed. With PH winning, there is obviously going to be loads of work to be done ahead of 2014. Give me an idea what the scope of work is likely going to be? Our theme for the World Book City year is Books: window to a world of possibilities. We have a series of programmes planned to run from April 23 2014 to April 22 2015. The wide range of proposed activities would involve people from different spheres of life as well as different age groups but with an emphasis on the youth. We would build on our existing work such as the Garden City Literary Festival and the Garden City Book Fair which is now into its 5th year, special readings with children, monthly readings. There are also new programmes to be implemented such as a reality TV show, radio programmes, online book clubs, etc. We would be calling on our music industry to compose a theme song for the year. 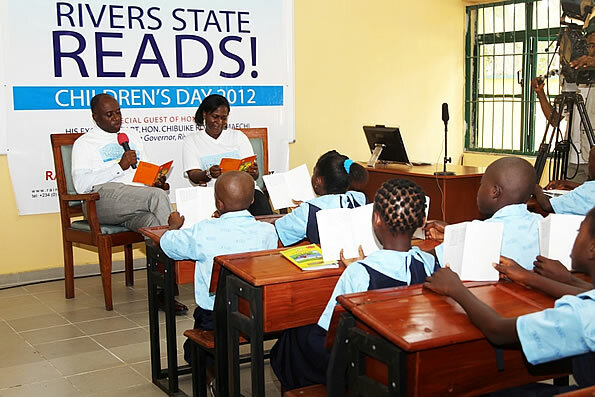 We would involve role models in different endeavours of life to act as ambassadors to the reading campaign. Also part of the plan is the establishment of a writers residency programme, youth symposium and various discussion groups. There is so much to be done. The scope is huge but I am confident that with a collective effort we can deliver a great World Book Capital year in 2014. Lagos and Ibadan have longer, more formidable literary heritage/histories. What do you expect Nigeria’s literati to make of PH’s new global status vis a vis these two major centres of literature? I think Nigeria’s literati would be excited that the nomination has come to Nigeria. Nominating a city in Nigeria is nominating the country; it is recognition for all of us. We salute the undisputed literary heritage of Lagos and Ibadan and acknowledge the part these great cities have played in Nigeria getting the nomination. Take the Garden City Literary Festival, for instance: it has been enriched by the participation and support of writers from these two cities. The majority of the publishers who exhibit at the Garden City Book Fair also come from Lagos and Ibadan. When we put in the bid we contacted PEN Nigeria and the Association of Nigerian Authors (ANA) head offices to inform them. A PEN Nigeria representative flew down to Port Harcourt to take part in the press conference announcing the bid, while ANA was represented by the PH chapter. Also, over the years, the Rainbow Book Club has partnered with these bodies as well as the literary community in these cities. It is a victory for Nigeria’s literati but only one city had to be presented and since the Rainbow Book Club put in the bid, it is only natural that we would best present the city from which we operate – Port Harcourt. Awofeso is a recent winner of the CNN/Multichoice African Journalist Awards.